While browsing through the pages of a travel guide in the early 2000’s we were surprised by its assertion that the Hundred Islands in Pangasinan was “overrated.” Instead, it suggested we visited the beaches of Dasol in the western part of the province. That suggestion was filed away in our memory banks until almost eight years later when we began encountering travel blogs featuring these beaches. In 2011 we finally paid a visit to Tambobong Beach in Dasol. The beach and its surrounding attractions were indeed alluring and pristine but the roads going there were extremely rough. The poor state of these roads discouraged us from going back. Tambobong beach, Dasol during our 2011 visit. Recently, however, we learned that much of the route to Tambobong from the national highway has been concreted, part of a major effort by the country’s Department of Tourism to develop the area’s tourism. We needed no further bidding. Before summer was over we were back in Dasol and enjoying its still pristine beaches. Tambobong Beach is situated several kilometers away from the town proper of Dasol, at the northeastern end of Dasol Bay. It actually covers two barangays – Tambobong and Quezon – but still retains the name of the former. What is interesting about Tambobong’s white sand beach is that it fronts a fishing village along its entire length. Dozens of colorful motorized bancas or outrigger boats used for fishing line the beach. But somehow, the locals have kept the white sand beach and its waters relatively clean, something you won’t see in most fishing villages elsewhere. It is clean enough that visitors swim in the waters offshore. We arrived at Tambobong in the afternoon, just in time for the low tide. The sea had receded scores of meters away from the shore, revealing a thick growth of sea grass and corals. Locals could be seen gathering shells and other marine creatures in the pools formed by the low tide. Curious, we were soon wandering around the tidal pools and observing quite a number of interesting marine life including starfish, sea cucumbers, crabs and some crawling creatures we couldn’t identify (fortunately no sea snakes). Because of its location on the western seaboard of Luzon, it would seem that Dasol’s beaches are in an excellent location for sunset views. Tambobong beach, however, faces south to southeast so you won’t really get direct sunset views here. But sunsets and sunrises here can still be pretty spectacular when the setting or rising sun lends its fiery colors to the surrounding sky. Summer skies are often cloudless –a fair amount of clouds are needed for spectacular sunset colors – but we still got to observe some pretty awesome sunsets during our stay here. Sunrise also colors the skies here. 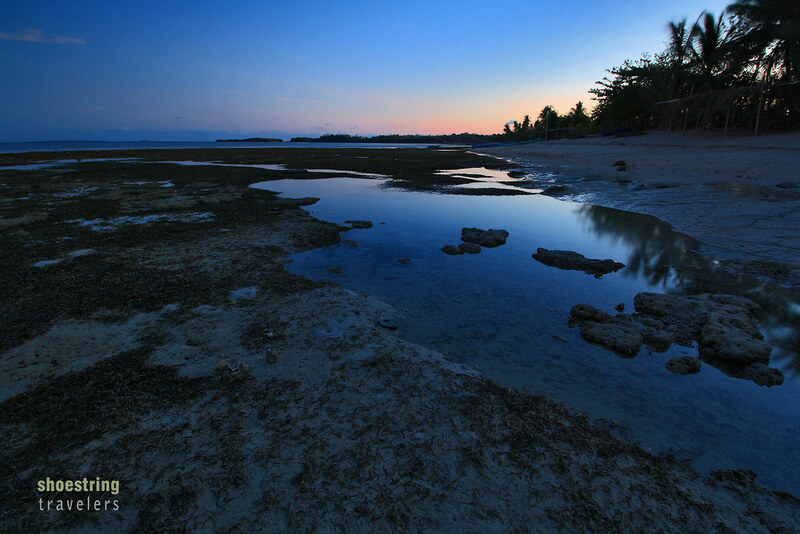 On our second day, while preparing for a day of island-hopping, we took a stroll along the beach at first light. It wasn’t a spectacular sunrise but the mood and colors of the morning skies were soothing. Island-hopping here means a visit to other attractions within 5 kilometers of Tambobong Beach and within Dasol Bay. Our first destination was Balinmanok Beach, a location just to the east of Tambobong. It is actually possible to walk to Balinmanok or to take a trike going there from Tambobong but it was more convenient to do so by boat; it’s just 15 minutes away by motorized outrigger from the front of our resort in Tambobong. Our rented outrigger at Balinmanok Beach. Balinmanok used to be a deserted beach until three years ago when a resort opened here. Another resort has recently opened. The beach however, has somehow managed to retain its pristine nature. 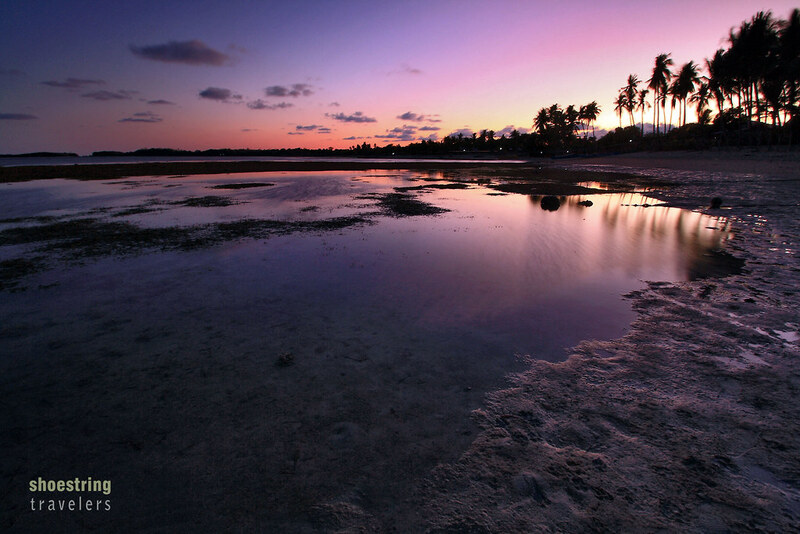 For the moment we are keeping our fingers crossed that development does not detract from the beauty of this beach. Just like Tambobong, there is a considerable amount of sea grass just a few meters off shore. Perhaps the most recognizable landmark here is a wooden shipwreck several meters from the beach. Allegedly this was the remains of a boat used for smuggling drugs. A few years ago authorities had apprehended the crew and subsequently towed the boat to its present location. Locals began stripping off timber from the boat until only a skeletal portion remained but a great deal of corals have grown around it, making it a haven for reef fishes. Together with the sea grass, the wreck has contributed to the proliferation of colorful fishes in Balinmanok. Balinmanok, for some reason, is not included in the island-hopping itinerary for boats coming from the western end of Tambobong. We had to request our boat operator to do so – and to do it for an extra fee. The additional fee? P100 ($2) resulting in a total fee of P800 ($18) for the whole island-hopping experience. We’re glad that the beaches of Tambobong and Balinmanok are finally getting the attention they deserve after being in the backwater for decades. But there’s an irony here that we’ve seen played out in other formerly hidden “paradise” destinations such as Boracay. Inaccessibility and lack of development have served to protect the beauty of these pristine destinations but as soon as these places become more accessible, irresponsible developers and visitors contribute to eventually tarnish the original beauty of such locations. We could only hope this cycle does not repeat its ugly self in the beaches of Dasol. Stay tuned for our next blog on the rest of our island-hopping destinations in Dasol. For directions in getting to the beaches of Tambobong and Balinmanok and for other travel tips, please go to this site. Posted in PangasinanTagged Balinmanok, beach, Dasol, outdoors, Pangasinan, philippines, Tambobong, travelBookmark the permalink. I looooove Dasol! Great write up plus the photos, theyre stunning!!! Thanks! There are more beaches up north – in Burgos – that are also nice (such as Cabongaoan Beach) but the roads have yet to be repaired. Yes agree! Sobrang bumpy din yng way to Cabongaoan. Nonetheless the beach is way better and peaceful than Bolinao. The DOT (Dep. 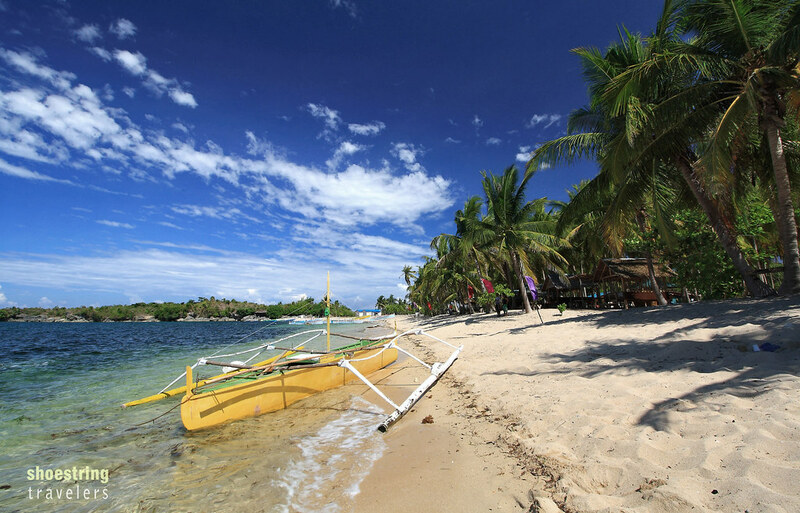 of Tourism) is behind the concreting of roads going to Dasol and Patar Beach in Bolinao. Hopefully they can also do the same for Burgos. True. Kaya siguro maganda ang Dasol because of its inaccessibility. Yes it should be okay. We visited Tambobong for the second time in May of last year; the waves were fine and we were able to ride on a small boat with no problems. Just do a check on the weather just in case – the weather these days is so unpredictable.